From handling dinosaur fossils and playing with dino puppets, to making dinosaurs walk on-screen, the past will truly be brought to life at a pre-historic showcase in Dundee this weekend (Saturday 8 July 2017). 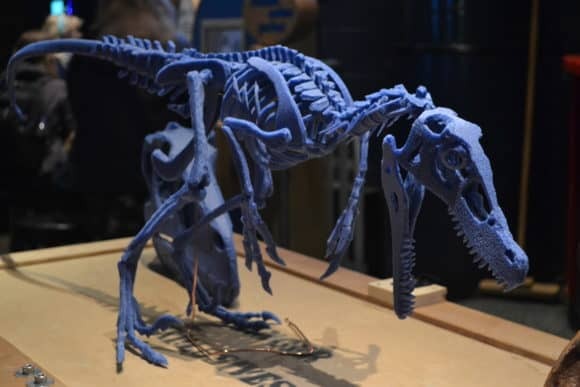 In what is the latest ‘Meet the Expert’ event at Dundee Science Centre, ‘Digging up Dinosaurs’ will run from 10am until 4pm and is included as part of normal admission. Those taking part include Alistair Grant from the University of Edinburgh, who will be challenging visitors to simulate how dinosaurs walk with his Raspberry Pi ‘super computer’. Meanwhile, Heather Barnes from the British Science Association will be offering drop-in activities including fossil handling and comparing living plants to fossil plants. She will also reveal a fascinating fossil time line spanning the staggering timeframe from 2 billion years ago to 10,000 years ago. Last but certainly not least, Perth-based paleo-artist Jon Hoad will be giving an insightful talk about dinosaurs, as well as hosting dino drop-in art activities where youngsters can recreate their own dinosaur on paper.